A limit is an object that restricts how much of a resource may be used at any given time. It is drawn on the canvas, like an activity, with a certain height and “duration”. The height at which the limit is drawn corresponds to the maximum value activities can consume of that resource when overlapping with the limit. After defining resources, assigning resources to activities, and adjusting the resource display settings, the user may set resource consumption limits for specific time periods. 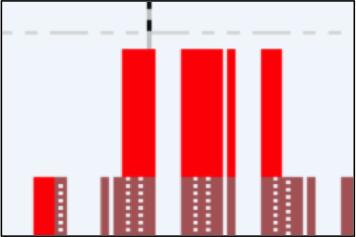 Any resource overage appears as a red portion of the histogram over each of the displayed resources. NOTE: A limit can never overlap on the timescale with another limit. As a result, a new limit cannot be added to a period that already has a limit. The original limit must be deleted, moved, or crashed in duration before a new one can be drawn. First, make sure that at least one resource plot is displayed on the canvas. To set a resource limit, click Tools > Manage Resources… from the menu bar. The Project Resources window opens. Click the Limit button. The Resource Limits window opens. First, select the resource for limit definition by clicking the resource name in the list. The following fields will fill accordingly. They may be modified or left as default. This is the ceiling, or upper bound of the ruler, up to which resource limits may be drawn. It cannot be greater than 2x the highest daily assignment of that resource to any given activity. In other words, for any given day, the ceiling cannot be more than twice the requirement for that day. Limits may only be drawn beneath this ceiling. This is a required field. This value refers to the amount of resources between each horizontal line. For convenience, the number of segments this corresponds to is also displayed below. This is how much vertical height the resource profile will cover, with 1 being the maximum. 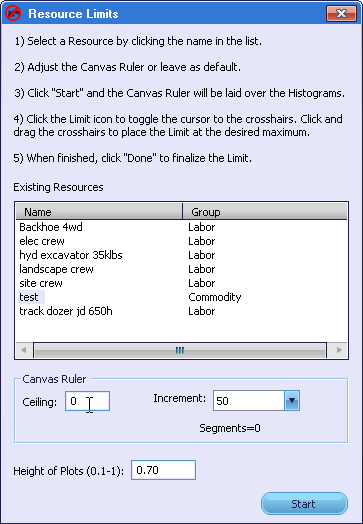 After modifying the fields or leaving them as default, click Start and the canvas ruler will be laid over the histograms. This ruler is provided as a system of measurement for drawing. Click the Limit icon to toggle the cursor between the Select Tool and the crosshairs. To add a limit object, click and drag the crosshairs, paying attention to both the grid level, or height, as well as the time period, or duration of the limit object. Limits may be drawn at any height beneath the maximum. 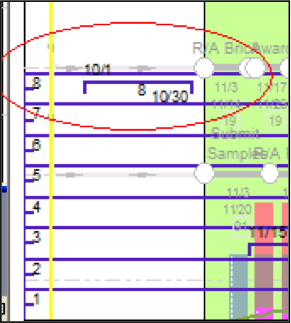 Once placed, the limit start date and end date are shown and the limit quantity displays under the bar. Click the Done button to finalize the limit. Additional limits may be assigned by repeating the steps above or concurrently before finalizing. In this example a maximum resource limit of 8 is set for a selected resource from 10/1 to 10/30. If any resource limits were assigned before for the selected resource, the limits corresponding to previous assignments are shown as purple bars. To modify or delete a resource limit, open the Assign Resource Limits window by clicking Tools > Manage Resources…from the menu bar and clicking the Limit button. At this point, a purple ruler spanning the canvas, or gridlines, will be laid over the histograms as well as any existing limit objects. To graphically modify a limit, hover over the end of the bar to access the double arrows or select the bar and use the arrow keys. To delete a limit, select it using the Select Tool and click Delete. After applying resource limits to selected resources, the out-of-limit portions can be highlighted. To display this warning, click the Resource Limit Mode icon on the toolbar. Overages are displayed in red. 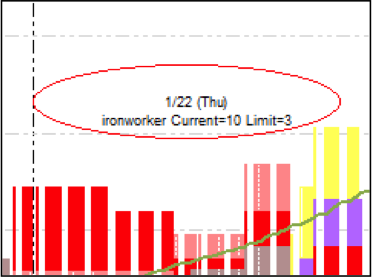 NOTE: Limit overages will only be displayed when the histogram is plotted in the same time unit as the schedule. To adjust how the histogram is calculated, see Modifying Individual Display Settings. To see specific overages, select Tools > Modify Resource Display Settings… from the resources section of the dropdown menu. The Resource Display Settings window opens. Select the checkbox under limits and click the Save button. Once this option is selected, it will display current and maximum resource consumption levels when the mouse cursor moves over any red portion of the Histogram.